With British Pie Week just beginning and Pierate - Pie Reviews becoming the leading promoter of the pie this British Pie Week, we thought that the week long celebration of pie needed a new logo! With the pastry company behind British Pie Week not promoting the week long event this year, there was no designated British Pie Week logo for 2017, so we at Pierate Pie Reviews have stepped in and can officially announce the new logo to the world! Featuring a pie design, knife, fork and the date, we've kept the logo simple but effective and we are happy for any websites, companies or other sources to use the logo for free. Unlike the previous logo, we're not looking to promote our brand or product, but simply want a logo that focuses on the pie and puts the pie back into the centre of British Pie Week! This is just the start of how we at Pierate Pie Reviews plan to be at the heart of British Pie Week 2017 and you can follow our adventures on twitter and this blog throughout the week, as we once again do our daily Pie Week Diary. Enjoy! For more information about British Pie Week, join the thousands of readers of our "British Pie Week - Everything you should know!" article! British Pie Week 2017 is from 6th to 12th March! If you’re a pie maker or pie seller we hope you'll find the new logo helpful - you're free to use it! Also if you have any special promotions for British Pie Week, get in touch with us and we can celebrate your British Pie Week offers! 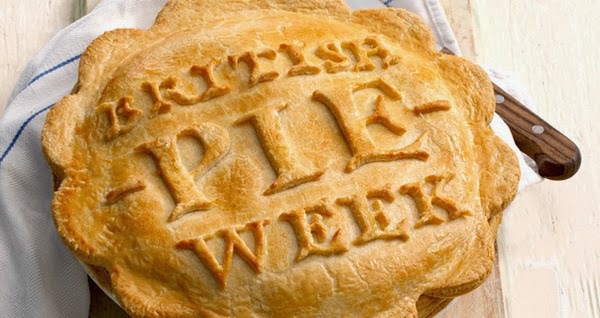 Either send us an email to pierateship@yahoo.co.uk or tweet us @pierateers to let us promote your pie week plans! Whatever you’re up to this British Pie Week, we hope you have pie and enjoy it! For more ideas, why not check out our #PiePledge video below?